Nancy has been a market leader and award-winning top agent throughout her 30-year real estate career. She is known as "the developers' agent," having been the sales director of five major projects. She has represented embassies, corporations, developers, and resale homeowners for over two generations of Washington-area families. Nancy is sought after for her expertise within the top echelons of business leaders and within the diplomatic community. She has represented major corporations (Exxon/Mobile, General Dynamics, IBM, among others) in their moves to the metro area. 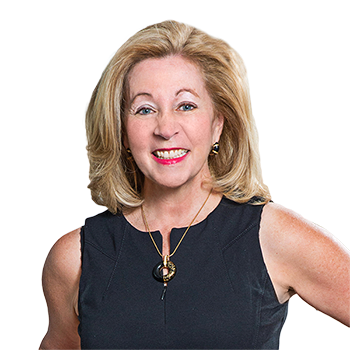 Recognized as a �market maker,� Nancy has been published in industry articles on the luxury marketplace and is often quoted in top publications such as the Wall Street Journal, Washington Business Journal, Washingtonian Magazine, and local papers. The Wall Street Journal and Real Trends recognized Nancy as the #9 agent in the USA in 2007 and has recognized her multiple times since then as one of the top agents in the country. Washingtonian Magazine has recognized her as well as one of Washington�s Best Agents in 2017, 2016, and previous years. DC Magazine has featured her in multiple years in their Leading Women in Business profiles. the 500+- acre Grasslands Farm in Middleburg, which sold for $12.5 million. She has listed and sold many prominent historic homes including the Fortas Estate and Macy Estate in Georgetown and Whitehaven just outside of Georgetown. Nancy recently published a coffee table book on the development of the legendary Somerset House condominiums, which she co-authored with the developer, Mr. Albert H. Small, Sr.